For a city that loves theatre and has given gems in performing arts, only one theatre won’t be enough. And one of the famous theatres of this culturally rich city is- Yashwantrao Chavan Natyagruha. Named after the first chief minister of independent Maharashtra, late Yashwantrao Chavan, this place is a hub for theatre and art enthusiasts of the city! Yashwantrao Chavan Natyagruha at Kothrud, established in the year 2000, has a capacity to hold 900 people with parking facilities of 60 four-wheelers and 125 two-wheelers. 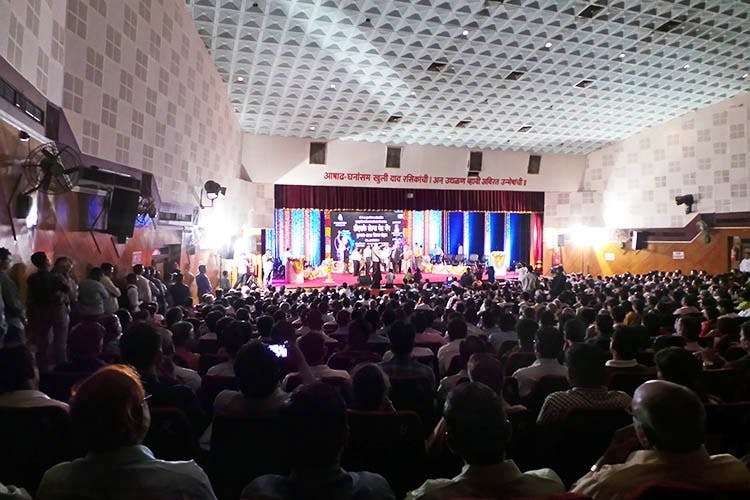 This place stages some of the best performances in the city – from Marathi dramas to orchestra, tamasha, magic, hypnotism, solo programme, folk dance, karandaks and more. The place also doubles up as an art gallery available for exhibition of handicrafts, paintings and works of upcoming artists. Apart from this, there are VIP rooms for special guests. Ticket price: Starting at INR 60. Enjoy plays and mesmerising live music at Yashwantrao Chavan Natyagruha.